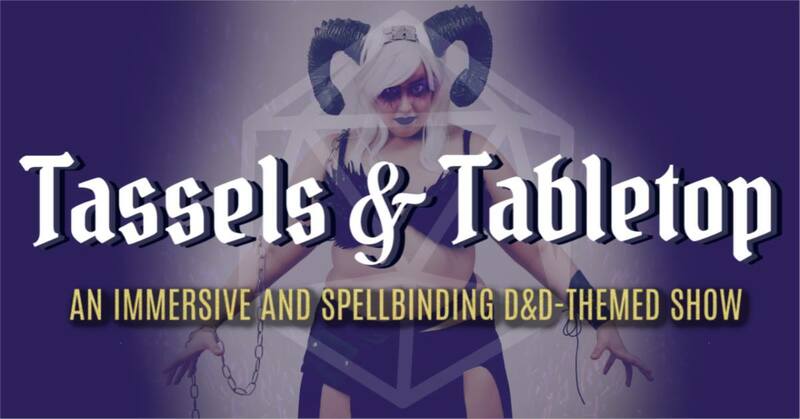 Tassels & Tabletop: D&D Bellydance and Burlesque Show! « Electromancy- A night of Industrial, Techno, Acid music. Join The League of Extraordinary Bellydancers for a spellbinding evening that blends D&D with belly dance, burlesque, and more. Whether you’re looking to enjoy a unique and captivating performance or participating in the entire Tassels & Tabletop weekend, this show is sure to be a critical hit! and your hosts, The League of Extraordinary Bellydancers! End your weekend adventure with a captivating and immersive performance experience like none other! This show is paired with the continuation and conclusion of Saturday night’s story. All show guests will have the chance to interact directly with the show’s narrative to unravel its mystery. Because it’s a continuation of the events of Saturday night’s D&D games, we don’t want to reveal too much about the show’s premise but rest assured it will be a ton of fun! Put on your favorite D&D themed-cosplay and practice your character voice—it’s time to indulge in a little bit of live-action roleplay as you interact with our performers and uncover the truth of the evening’s events. Does the thought of mild LARPing or anything involving roleplay, cosplay, or interacting with performers terrify you? Don’t worry! You’re also welcome to enjoy the show as an audience member NPC (Non-Player Character for those unfamiliar with the term). Sit back and enjoy the performances and intriguing atmosphere, we guarantee you’ll have a great time!